This is my first attempt at installing glass art onto a fixture of the urban/street environment. It’s real rudimentary and unrefined, the glass sculpting is far from spectacular and the shape is wonky, but I really love it and am quite proud of the piece! Here are my first few experiments with re-working found paint, and the detritus associated with graffiti and street art. 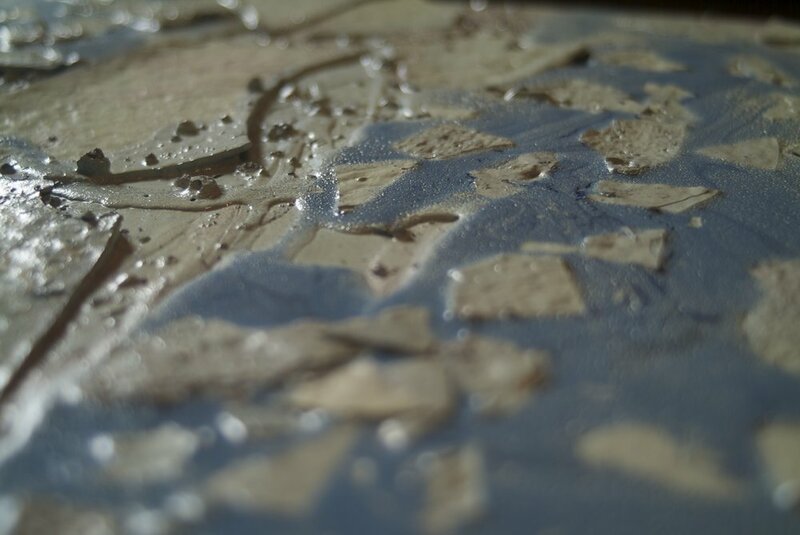 These photos are process and work-in-progress shots from my time in the studio creating the first few pieces. 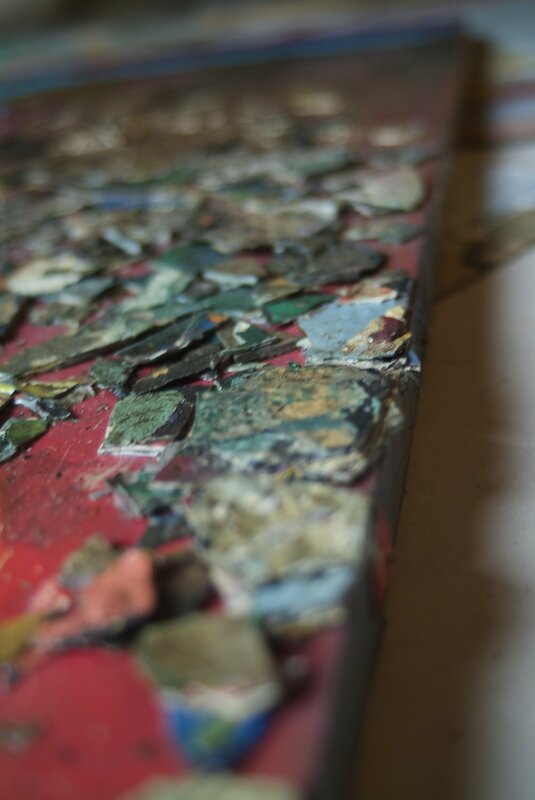 The process consisted of layering and embedding the paint onto a surface and then sanding, chipping away, and repainting the surface in order to create a composition with the desired aesthetic and artistic qualities. My early days in glassblowing were learning how to shape, work with color and form. Using nature as my inspiration and experimentation site I took my practice out into the world to find interesting photos of the work. This inspiration later became my street art. Have you ever listened to a song over and over again to try and literally possess a part of it, only to have what you were searching for slip through your fingers every time. Attempting to hold onto and physically grasp a portion of a song in order to access it whenever you wanted, separate from the auditory experience is not possible. This impossibility can be experienced as you attempt the futile experiment, but what you are inevitably left with is a portion of the music stored in your memory, it is of course the only real way of possessing and accessing the experience removed from it’s sonic locale. The music is trapped upon its chosen medium. Such a funny and ephemeral thing sound can be and is only invoked through ritual vibration, either the vibrating of vocal chords, an instruments strings, or initiating playback on a stereo and observing the wavelengths with our ears. It’s access is limited to us and it’s nature is impermanent, much different than the visual concrete world we occupy daily. When we observe the world with our eyes we expect it to stay put. In all honesty the aural experience and the above test have little to do with the visual outcome of the project, but it did serve as the inspiration and motivation behind the projects creation. A chance moment of discovery and the above line of thinking sparked my artistic side into action and what shocked itself into life was well over 50 successful pieces in the series (not to mention the numerous failures). For this post I’ve only attached a few examples as to not entirely bore you all to death. It was the morning after I made a small fire in the fireplace that I noticed a piece of paper had burned in their with the image revealed in ash almost entirely intact. Noticing this prompted me to experiment with the process of burning a piece of paper and retaining the original image that was still visible in the ash. 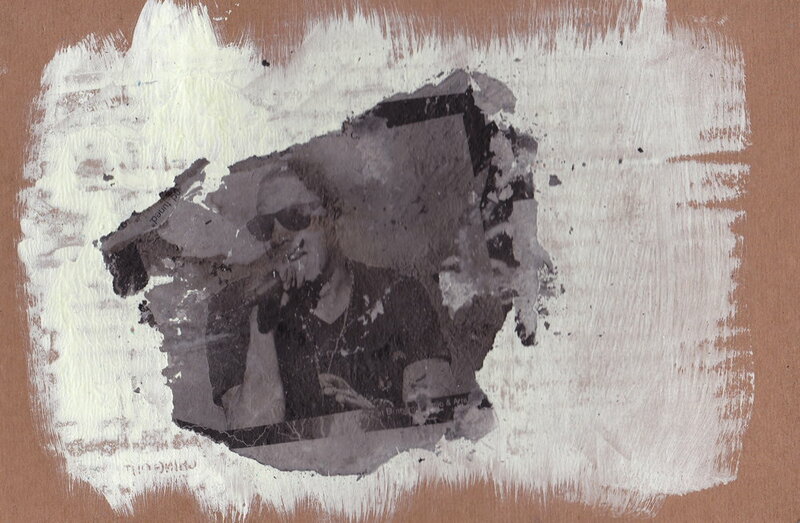 As carefully as possible (seriously) I gathered the ashes and pressed them onto a freshly gessoed piece of cardboard, seeking to distort the image as little as possible. I found as I kept working that the distorted images could be almost as compelling as the clean ones and kept a number of those rubbings as well. Capturing the ephemeral, the nearly imperceptible, and the impermanent has always been one of the most compelling goals to my artistic person, this is one of those projects. The choice to use musicians stemmed from my thought experiment and the desire to try and retain physically a section of a song. Also the nature of musicians and the lifestyle they live speaks to the same overall themes I was interested in. Much like the image leftover in the ash after a fire, the music of all of these individuals will live on long after they are dead and gone. I would also like to add that after the project was set aside I realized that it was a form of drawing practice. Here's a few shots from the University of Oregon group show Critical Art Nov 16 2017, curated by the talented Andre Sirois. Bobby Hundreds, Hal Hefner, Recycled Propaganda and myself were featured artists, as well as a select group of students and other community artists were chosen to participate. The event was a blast and had great messages to make you think and react. My wife and daughter checking out the Hal Hefner work. Spin Laden x Recycled Propaganda "Crude"
...and finally Andre get all the congratulations from his crew. Sifting through the Sands of art.